KG3 IR Absorption vs IR Blocking filters? Same? - SolarChat! I broke a KG3 today. 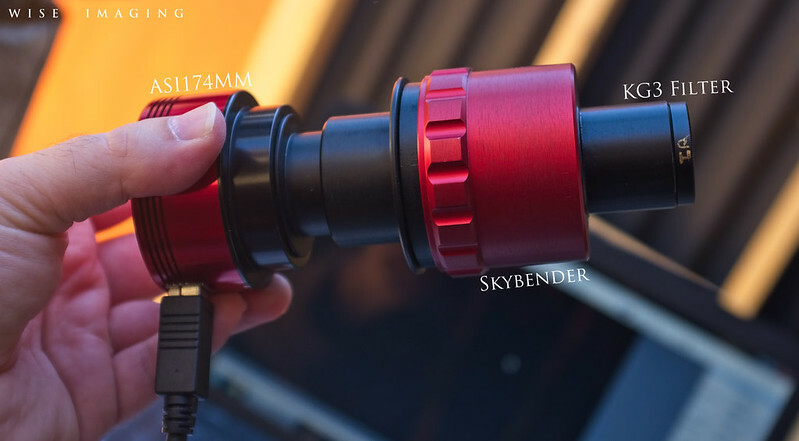 Looking to replace it for a DIY kit (the Skybender) that I use to image in 393nm and 540nm. Dunno how I broke it, but when I was tilt-tuning with the Skybender I heard a sound and looked in there and found the IR filter (KG3) with a total crack down the center. Only looking for 1.25" size. Is a KG3 IR absorption filter the same as an IR blocking filter? I can readily find IR blocking filters. But IR absorption, like the KG3, is different maybe? It's only purpose is to reject heat and allow 393nm and 500~540nm pass. If you check out the KG3 transmission curve, you'll see it acts as a UV-IR blocker. You probably should replace like with like. Adding just an IR filter won't cut the UV side. Is a KG3 IR absorption filter the same as an IR blocking filter? I can readily find IR blocking filters. But IR absorption, like the KG3, is different maybe? I just ordered a new KG3 from NewPort (same exact filter). Just was curious if there was a way to make it even better compared to absorption versus reflection, etc, regarding IR. I'm mostly interested in 393nm with it, as an inexpensive way to play with near Calcium with a Skybender for now, rather than shell out for a Quark CA or Lunt CA (can't do the Lunt CA, if its limited to 100mm apertures, I don't want something that has a hard limit). Rarely see the Quark CA's used, or I'd get one. So until then, I'll fool with the Skybender. It does seem to work decently to show something significantly different from just white light. And I have a set of 532nm filters to use with it too, along with a 540nm filter, to play around in white light more and try to see if I can do better convection cells that way, as soon as the KG3 arrives to test it out. Remember that at 393 nm that 100 mm aperture is equivalent to about 166 mm of aperture at 656 nm. You can also go larger with more sophisticated ERF/blocking filter implementations. Experimenting with some older tech and older information, simply new to me! Can't find it in any of the documentation, but does it matter which side of the KG3 is facing the heat source (sun)? I got it in today, but it's just the glass, and I have to put it in filter cell which I have, but just wanted to make sure it's not directional. One side has the KG3 printed on it plainly to see. But again, the documentation on the filter, and on the website, doesn't really cover whether it matters what direction or face the filter is used. Thanks! Did the trick and took care of the heat, back in business. If you are using that with a 120mm scope on the nosepiece like that my money is that the heat will crack it. I've been imaging this way for months and so far, no cracking. Granted, I image for maybe 30 minutes in the morning. I don't go for hours and hours all day with it. 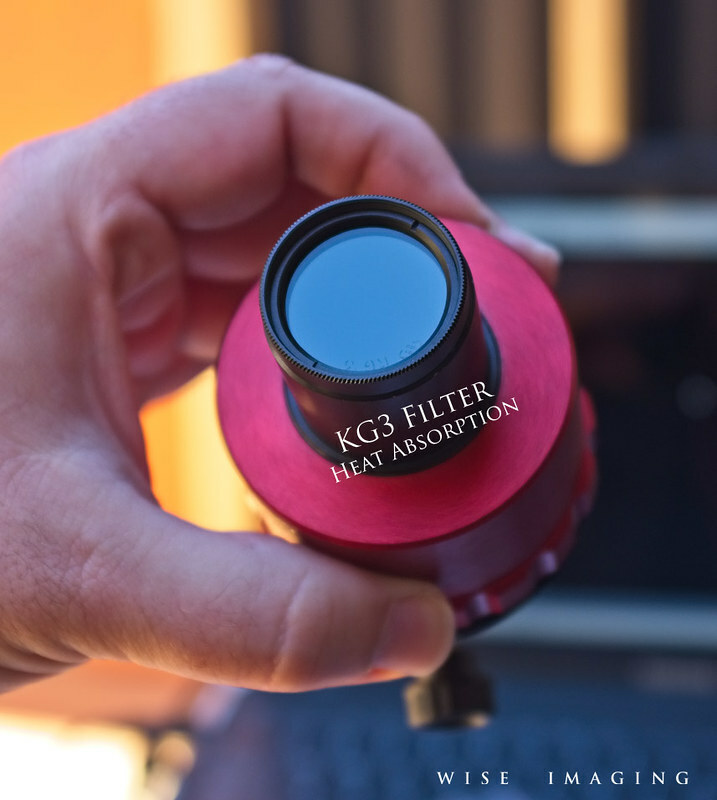 A KG3 filter absorbs energy from the infrared. In other words, the energy received is accumulated in the KG3. So the temperature of the filter increases untill an equilibrum is reached when the energy radiated by the filter equals the energy received. A dielectric (multicoated) IR blocking filter is a different beast. The substrate is transparent, which means it doesn't accumulate heat. This is the work of the coating to reflect IR. This is done with some energy losses, which means a very small amount of energy is transfered to the subtrate. This is very minimal. So, no dilation and no filter breaking (unless you use a large scope). So, a dielectric filter is the way to go. But ... dielectric filters do not cut IR beyond about 1100 nm. This might be an issue or not, depending on the size of the scope. Depending on the optical setup, the use of a red multicoated filter could also be a good option. As you said, the Beloptik filter is a dielectric filter. The coating reduces the heat load on the substrate. That would be a different story with a KG3 with no coating. I broke the KG3 already. It spent a lot of time in my 120mm refractor eating full sun and succame after a 3 hour session and broke. So, that means I need to either look into this dielectric IR cut KG3 filter you're all mentioning, or I need to look into some kind of ERF. Gotta compare some stuff. Would appreciate links to any of this stuff (USA here, if it matters). That link above to Beloptik is a filter that blocks UV, which means, it blocks the 393nm wavelength, and would not be useful for a Calcium set.... right? I'm starting to really think about the Quark CaH and Lunt CaK at this point. Ugh. I've just acquired one for testing on my Omega CaK stack. That is a prefilter you got and the kg3 was the secondary, . That's not what Apollo (the guy that made this) said to do... I have it in the configuration he said it was supposed to be in when he gave it to me. But, I don't know any better honestly, so for all I know maybe it is wrong. I'm at the point where I need to just pony up on a Lunt Cak or Quark CaH. Put the 395 filter I have on the nose of the extension tube, and put that into the focuser. Then, put the skybender (or any train with the 393nm filters) back towards the camera side. I wonder if it would vignette big time. Alternatively, I wonder if I can find a way to make an ERF for this in general, such as a 2" filter of some kind (like the blue filters?) and put that first, then the 395nm, then the 393nm? Hrm, if that filter works (Baader 2458475B) as an ERF (blocking IR, and other wavelengths, but keeping UV), then further narrowing it with my 395nm filter, I could then use the two 393nm filters to further narrow it down maybe. The thing I have to figure out is just how to manage the heat from a 120mm aperture with this. I look forwarding seeing how the baader blue filter works as an ERF. If it does, I'll have to consider it. If I can get away from using IR only blocking/absorbing filters, like the KG series, that would be good. I just need to be able to use it on large apertures. Even if I had to do the blue then an additional IR blocker/reflector, then the 395nm, then the 393nm, that would be fine. The Quark manual (updated) states it can go up to 150mm with just the Quark Calcium & a UV/IR cut filter. Lunt limited to 100mm makes sense, but over 100mm, an ERF could be employed (Aires?). I'm very interested to see how a Baader Blue CCD filter -> UV/IR block -> paper burn goes. I doubt the reflected heat is an issue. This is done with internal ERF's in some systems, and the Quark Chromosphere does it too, it reflects the heat back out. I don't get haze or anything in my Quark and I use the UV/IR cut filter. Other people using whatever etalon and internal ERF's are also reflecting heat back out. I might be a little bit off topic, but as an information, I use a 50 mm Blue Astronomik filter placed 220 mm ahead of the focus for Ca K imaging with my TOA 150. The filter is slighlty tilted to avoid reflections. What aperture and focal length scope did you use???? As soon as the spin off storm from tropical storm Alberto rolls away from me, I'll test some things. When I have my 395nm filters and the two 393nm filters in line, I don't even get a light path on my hand behind it, it blocks so much. I don't even feel heat. But that KG3 before them sure did and cracked. It probably helps with heat, just enough to not melt the metal/glass/sensor. We're testing the heat on paper, leaves, plastic, etc. Things that will have a higher combustion point as it is. So maybe they're meant to take high temps and this gets it just low enough to not melt. I'm curious how the blue blocking filter will handle things. Anything in the $500+ arena, I wouldn't consider, as at that point you can get a Lunt modul, or a smaller ERF made. Last edited by MalVeauX on Wed May 30, 2018 1:38 am, edited 1 time in total. Very interesting that red + UV/IR block filter. Especially considering the cost of a Lunt blocking or Coronado blocking filter of good diameter size. Problem with UV/IR with near UV imaging is the UV kills the imaging. My badder UV/IR filter totally killed my ability to see anything when I put it inline with my Skybender loaded with 395nm pass and two 393nm pass filters. Was a grey wall. Pulled out the uv/ir filter and suddenly a disc was there.